In today's Internet market, having a website alone simply does not cut it. Think of how many websites there are, and how many more are being put online every day. Your website must be found easily in your local market and globally. Search engines such as Google, Yahoo, Bing, Ask, Yandex and Baidu are the main method for finding websites. They are the Internet's directory. Ideally, your website should rank as high as possible in specific search engine results and more often in generic search results. Not just in the name of your company/organisation - if they already knew this, they wouldn't need a search engine so much to find you - but in common key words, terms and phrases most people are entering into search queries to find products/services/information similar to yours. 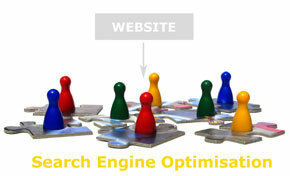 Search Engine Optimisation (SEO) is the process of improving your website's chances of achieving this higher ranking. Around 95% of online activity starts with a search engine (even when someone knows the URL of a website, they now find it easier and faster to hit on the page via a search result). Google has around 65-70% of the search engine market share. 70-80% of users ignore paid search ads, focusing on organic results. Over 83% of internet users use search. There are many different types of search engines worldwide, although most are standardised. 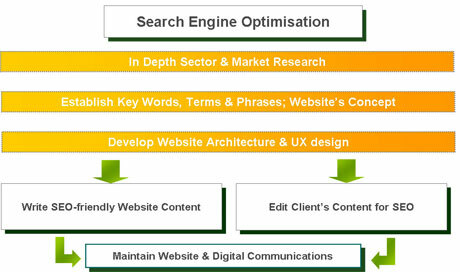 A well optimised website with quality content achieves good ranking in most. 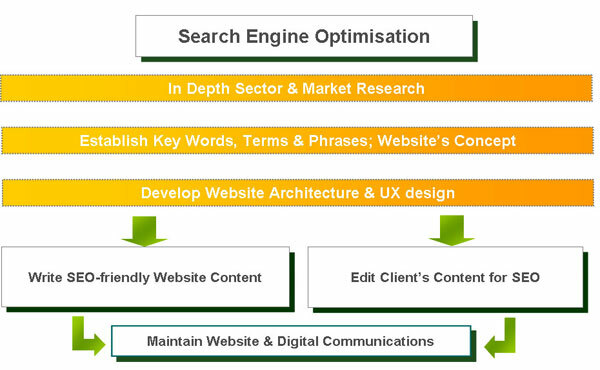 Organic Search Engine Optimisation (SEO) is Web-Conception's number one specialisation. All services in website design and development are more or less geared at boosting your website's ranking in all major search engines, and in improving overall website presence online. We've adopted a methodology to help you stay competitive online and at a fraction of the costs. Our main markets are Cyprus-Europe and Melbourne-Australia, but we can work with clients globally. At Web-Conceptions, we are very competitive by nature and want to prove we have what it takes in SEO. At the same time, we always over-emphasise notions of customer service. We keep working and working behind the scenes, even if you're not aware of it. With SEO, this is especially important, as the sector is always evolving, and so should your website. Our goal is to help make your website succeed. And to do this, we believe SEO is fundamental. First of all, it's important to highlight that all basic on-page organic Search Engine Optimisation (SEO) is always included in each website design and development solution. This includes adding meta tags for each separate web page, URL page structure, internal links, advice on domain names, and submitting your website to search engine directories. Most web developers offer this in their web development services. However, we always go many steps further. That's why we always manage to achieve excellent search engine ranking and online presence. See examples of our organic search engine ranking success in some of the most competitive sectors in each respective market. Research: we always conduct original and in depth sector and market research before starting anything else. This allows us to better understand your industry, target/emerging markets and competitors, as well as helps us to generate the most important and relevant key words, terms and phrases needed for your website. Overall, it sets the foundations for your website development and ongoing digital marketing communications positioning. Our research team has over 15 years international experience in market and content research, having worked within media research and writing, as well as research for business and large scale investment projects. Writing website content: we are currently living through the information revolution. The Internet is all about Information just as much as it's about Communication. As such it stands to reason that it's your website's content that is most important when search engines rank which website is most relevant to a search query. How else would they judge it? We are one of few website designers/developers that actually build your website and write (or edit) your entire website's content in-house. This means our programmers/developers, writers and marketers work very closely together, able to implement a combination of unmatched SEO strategies. Website content copywriting is a key part of our web design and development service, and is done not before or after, but simultaneously during the development process. Our web content writers have extensive international and local experience in creative and technical copywriting, as well as journalism, online PR and marketing communications - mainly in media and business related fields. They also have a wealth of experience in website content copywriting. This has enabled them to build a thorough understanding of digital writing characteristics, knowing how to write specifically for Search Engine Optimisation purposes - SEO-friendly content. In turn, quality content on your website aids in generating back-links - the other key component to SEO. This can be supported and provoked with some online 'running around' and building relationships with other website vendors and portals. Website design architecture: one of the main reasons why our websites always achieve strong ranking (fair to say ranking higher than most websites developed these days) is because we build fully customised HTML static content-based websites, and do not use ready-made CMS platforms. So even before any deep SEO methodology is adopted, we are already miles ahead! SEO is our inherent duty as website developers. We want all our website projects to rank well. We always develop a website that is already extremely well structured to boost search engine ranking, and that subsequently allows the client to maintain content themselves, therefore stay competitive in SEO and digital communications. Alternatively, we can offer ongoing services should a client require assistance with maintaining website content and/or other SEO strategies on their behalf. Thus far, we've mainly offered this service in Cyprus, Greece and Melbourne, but can potentially work with clients globally.